1822-002, PTK, photographed in Zduńska Wola Karsznice on September 23, 2009. 1822-002 and 1822-005 at the Rybnik depot, April 21, 2009. Photo by Petr Štefek (from www.pl.wikipedia.org). In 1992 Austrian state railways ÖBB purchased five two-system (3 kV DC, 15 kV 16 2/3 Hz) class 1822 universal electric locomotives, intended to haul freight trains between Germany and Italy – hence unofficially known as ‘Brennerloks’. They had been built by Simmering-Graz-Pauker (SGP, serial numbers 80510 through 80514/1991) and developed from earlier class 1014 (18 examples, mainly for express trains). Compared to 1014, they were slightly longer, heavier and slower, but provided almost 50 percent more power, tractive effort being 28.5 tonnes. After thorough tests first of them, 1822 003 was accepted for service in September 1993, the remaining four following only in May 1996. Their final assignment differed from that originally planned, as they were used mainly with transit Italian passenger trains between Brenner and Innichen. After traffic reorganization (related mainly to the introduction of class E464 locomotives by Italian railways FS and later class 1216 by ÖBB) 1822s were declared surplus. In 2005, four were operational and 1822 003 was intended for cannibalization. All were based in Innsbruck; their last reported service was in June 2007. In 2005 two were sold to PTKiGK Rybnik; 1822 005-3 arrived on January 20 and 1822 002-0 followed on October 27. After minor modifications both were impressed into service. 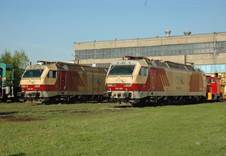 In 2008 PTKiGK Rybnik was merged into PCC, so these locomotives formally became the property of PCC Rybnik, although continued to carry their old liveries. Service numbers have been retained. With PCC finally absorbed by DB Schenker, both 1822s went to DB Schenker Rail Polska. 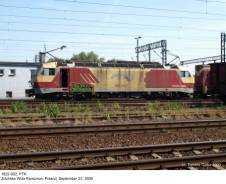 At the moment of their arrival 1822s were the most modern and most powerful single-section electric locomotives in Poland; they maintained this position until the appearance of first EU43s (TRAXX F140MS from Bombardier Transportation) in December 2007. Their operation was not entirely satisfactory and failure rate was reported as rather high; as the entire class numbered just five examples, there were serious problems with spare parts. PTKiGK Rybnik intended to purchase also the remaining three examples, but this proved impossible, as – due to the contract between ÖBB and banks – they are not allowed to leave Austria until 2015. In 2011, following serious failures, both Polish 1822s were withdrawn from use and dumped at the former Spedkol depot in Blachownia, awaiting decision on their ultimate fate. They were finally sold for scrap in January 2014. Next April all remaining three locomotives of this type were sold by ÖBB to Austrian TecSol GmbH electric engineering company.